Here it is, less than a week after returning home from Evaluation 2013, and I’ve already used what I’ve learned in all three workplace settings. I’ve also enjoyed reading other bloggers’ conference highlights (see below for links) as they in a sense, let me peer vicariously into sessions I didn’t attend, or they enhance my own experience by offering a different perspective on sessions I did attend. I’ve never met an evaluator who wasn’t a fan of Michael Quinn Patton (Whatsoever would we have to talk about?). I eagerly attended several sessions with this exceptionally brilliant evaluator and captivating presenter – the only evaluator I know with his own hashtag. In his State of Developmental Evaluation in the Early 21st Century, Patton presented his analysis of the Evaluation 2013 catalog with respect to DE. He found 38 sessions that included DE in the title or abstract and shared that a content analysis of their descriptions revealed that sessions aligned with several themes: complexity and systems change, DE in practice and action (from theory to practice), DE applied to a specific area (e.g. human services, schools, etc. ), DE combined with other approaches, and the role and position of the DE evaluator. Patton emphasized that DE is responsive to culture and context, and as an evaluation approach, it is a “cultural chameleon” in that it takes on and is sensitive to local context. DE is not method prescriptive, and outcomes and indicators may not be predetermined for a program undergoing DE. In fact, in some cases, it may even be culturally insensitive to predetermine outcomes. A traditional logic model, Patton claims, cannot capture the complexity inherent in an innovative program where the destination is not predetermined, nor is the journey itself. DE, however, can offer a depth of understanding of a complex, dynamic program where traditional approaches simply cannot. In his State of Qualitative Methods in the 21st Century, Patton highlighted some straightforward timely trends including powerful qualitative data analysis software (along with support systems and training); social media as data, for data collection, and for sharing findings; ethical challenges such as anticipating impact on participants, confidentiality with small sample sizes, appropriate compensation, and IRB constraints; the use of mixed methods; and data visualization. He spoke of qualitative evaluation as an intervention in the context of process use. Reflective practice experiences are “forms of engagement where the evaluation functions and the inquiry functions are merged and can’t be disentangled from the intervention.” He also spoke of valuing deep contextual understanding and maintains that qualitative inquiry has a high degree of sensitivity to context. “Sensitivity to context,” he proffers, “becomes a value-added dimension of qualitative inquiry.” The qualitative evaluator as the instrument was his next point as he emphasized “who does the work matters.” What the evaluator brings to the work becomes more important as experience, expertise, and cultural competence are developed in the individual. Patton continued with an articulation of purposeful sampling options: “What you have something to say about is what you sample” and admitted that this is a huge area of misunderstanding and controversy. He explained the terms purposeful vs. purposive sampling and shared that the former is his preference and the latter somewhat nonsensical, however, there is no conceptual difference in the terms. Finally, Patton closed this session with his own take on Hamlet’s ubiquitous soliloquy: “To sample or not to sample…” If anyone has a recording or transcription I’d love to have it! Check out the cartoon by Chris Lysy on the “Michael Quinn Patton system.” Lysy aptly prognosticated in anticipation of the conference, “the development of star systems caused by evaluators being pulled in by the gravity of their evaluation heroes.” I’m pretty sure that’s me just southeast of MQP, almost to the inner circle. I registered for this pre-conference professional development workshop because I feel no evaluator should go without the extraordinary experience of learning from Michael Scriven himself. You don’t have to agree with Scriven on all points, but you simply must hear him speak and read at least some (the man has 450+ publications. His CV is 41 pages!) of his work to appreciate his unique perspicacity and unfailing dedication to the field. The icing on the cake of this workshop was that Jane Davidson presented alongside Scriven, creating a dynamic duo, to say the least. When Professor Scriven launched into the history of evaluation, I thought he would do so with what seemed to me a natural starting point – Ralph Tyler and the “Eight Year Study.” Not a chance. No, Scriven gave us the history of evaluation starting about two million years ago, his estimate of the time homo sapiens emerged. Yes, evaluation is truly the oldest profession (my words, not his). Early humans made everyday decisions (read: evaluation) of what foods to eat and what tools to use, and thus, had to assess the quality therein, and subsequently share this evaluation know-how with other humans. Simply put, they had to make evaluative claims in order to survive. With regard to ESM, Scriven and Davidson maintained that while we get non-evaluation specific coursework in graduate school (e.g. RCTs, statistics, interviews, surveys, content analysis, causal inference methods), we don’t tend to get ESM (e.g. needs and values assessment, merit determination, importance weighting, evaluative synthesis, value-for-money-analysis). And, they claim, if we are not using ESM, we are not doing evaluation. Davidson and Scriven continued the course with an extended discussion of evaluative tasks – 1.) critical description of evaluand; 2.) point of view; 3.) identify and define relevant values; 4.) dimensions of merit; 5.) weight the values; 6.) validate values & weights; 7.) fieldwork / gather evidence; and 8.) convert, synthesize via rubrics – with special emphasis on point of view. Point of view, Davidson claims, goes beyond just getting different perspectives. She offered the example of buying a watch as a metaphor for approaching an evaluation. “Are you evaluating a watch for its ability to keep time, or as a piece of jewelry? What is the frame or angle of the evaluation? In what ways are you looking at the evaluand?” Scriven jumped in and stated, “the point of view determines what will be the relevant evaluation questions. You need to be clear what point of view you are investigating.” Davidson then launched into an explanation of rubrics (illustrated by a richly described New Zealand example) as one evaluative tool to assist evaluators in interpreting evidence in evaluative ways. “Rubrics help us define what quality and value should be,” she explained. The ESM workshop was a heady, theoretical, inspiring first day of what proved to be a stellar conference week. I strongly recommend getting information on information design for evaluation from the designer herself: Check out stephanieevergree.com and look for her new book Presenting Data Effectively. I was quite fond of telling folks at the conference that I practically knocked someone over at the SAGE Publications vendor table competing for one of the limited copies for sale there. I rounded out my week with the last remaining #eval13 diehards on Sunday with a professional development course with Stewart Donaldson and John Gargani. Their premise as they opened the course was that evaluators are often program designers, or program re-designers. Using a particular program as a case study, they posed the question. “What are the most important actions that [the program] must make to achieve its desired impacts?” A systematic approach to program design is necessary, they claimed, because many programs are not put together in a systematic, logical way. No surprises here! They offered their definitions of program – “A reliable way of producing impact” – and of program design – “Everything that someone needs to implement a close replication of a program and produce the desired impact without ever speaking to the designer.” They readily admitted that the latter definition is more aspiration than reality. In order to help participants understand Program Design, the presenters shared a diagram with program design at the center. Out from that center are spokes for Impact Design, Process Design, Business Design, Values Design, and Evaluation Design. Donaldson and Gargani warned participants that the values being promoted by the program may change over time; this may be purposeful and by design, or by accident. Sometimes programs end up promoting values they don’t in fact, want to promote. Program design, they explained, is a way to operationalize your program theory – it’s a representation of program theory. They went on to elucidate the rules for their “Very Simply Process Flow Diagram” – 3 boxes, 3 rules. The boxes are IN, DO, and OUT. DO is expressed as a subject-verb-object, as in “staff enroll participants” or “facilitators train participants.” The three rules are: 1.) Every box in the impact design corresponds to at least one DO box; 2.) Every box in the process design has a subject-verb-object label; and 3.) Every subject has at least one path from IN to OUT (there may be multiple ways for people to move in or out). The presenters called the conduits between boxes “pipes” as they explained that the pipes may be leaky (i.e. people may drop out or take different paths). The boundaries of a program, they admitted may not be clear, and advised that we should stop when it’s no longer helpful to pursue a path. 5.) Blogging for fun and sport! I had the distinct and unique pleasure to present a session with three of my favorite evaluation folks – Ann K. Emery, Chris Lysy, and Susan Kistler. The four of us have been corresponding for quite some time and share an interest in and enthusiasm for evaluation blogging. We come from diverse perspectives, professions, levels of interest and experience in blogging, along with different goals, and future plans for our own blogs. I thought we made an excellent team to offer insight and advice to potential, new, and experienced bloggers who attended. In fact, I continue to be awed and humbled by their combined wisdom, creativity, insight and generosity as each has offered me support, encouragement and advice as the newest blogger of the group. Decades after realizing I just wasn’t one of the cool kids, I’ve come to terms with being nerdy. In fact, I do believe it’s the “in” thing now (housewives and other ill-behaved reality TV stars notwithstanding), making a welcome resurgence after our famed 1980s aptly titled movie. 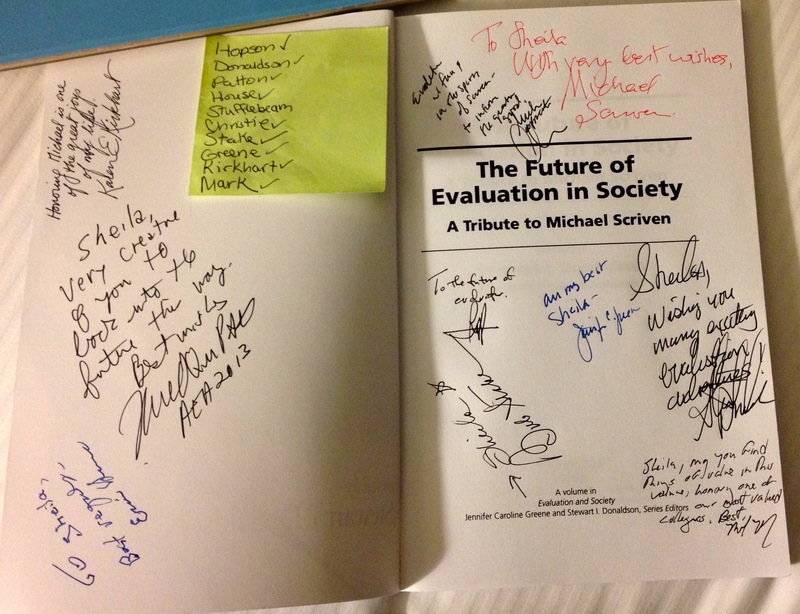 Just before #eval13, I purchased a copy of The Future of Evaluation in Society: A Tribute to Michael Scriven, and, as I mentioned in an earlier post, it arrived just in time to tuck into the suitcase with the intent of having it autographed by the tributee. After a successful bid for the professor’s signature, I opened the cover to peruse the table of contents only to discover that to my knowledge, just about every contributing author was there in DC. It was then I established my quest and with a little green sticky note list in hand, began hunting evaluators. For the next 50+ hours I peered around corners, squinted at name tags, and enlisted the help of some well-connected colleagues. One shouted at me from down the hotel hallway pointing wildly, “Sheila! There’s Jennifer Greene! Go get her!” Another stole me away from a friend at the reception to point out Ernie House. One by one, I approached them all, any remnants of bashful inhibition melting away with each subsequent signature. Only Daniel Stufflebeam was not to be found, and I understood later that he was unable to attend the conference after all. I would have loved the opportunity to meet him, and fantasize about sending him a little blank white card to sign and send back, so that I can paste it into my treasure. Each evaluator was incredibly kind, affable, and accommodating as I interrupted conversations , stopped them in hallways, or followed them out of elevators. After all, I’m hardly alone in my interest in chatting with “the big names” and had to compete for time and space with more experienced and accomplished evaluators. Would you like to know who is on the list of contributing authors to this terrific tome? Of course you would! I strongly suggest you purchase the book, though. It’s fabulously well-written and a fascinating read. No surprise there, if you’re a devout evaluation nerd. My #eval13 treasure – The Great Big Nerd Project! Stufflebeam, Christie, House, Greene, Stake, and Mel Mark. But do you recaaaaaaaall the most famous evaluator of all. Well, that’s just about enough singing for one day, now. Anyone care to finish the line? I just couldn’t bear to be so irreverent. SO…did you make it to the end (or even skip to the end)? If so, I’d love to know your thoughts on this first longform post. To enjoy different perspectives on #eval13, check out these creative and insightful conference reflections from fellow bloggers: Ann K Emery, Chris Lysy, John Gargani, Chi Yan Lam, James Pann, Ann Price, Brownyn Mauldin, and Mary S Nash. If you are aware of others who have blogged about their experiences at #eval13, please let me know! Thanks Sheila for the conference reflections. Back home in NZ from AEA13 and only now beginning to think about pulling some conference reflections together for the anzea (Aotearoa New Zealand Evaluation Association) newsletter – and maybe even resurrect my blog which has been largely dormant for the last 18 months. Thanks also for the links to the other AEA13 Conference Bloggers. It’s a good way to get a sense of how others experienced the conference and also feedback on sessions and presenter. It’s really interesting – that with over 600 sessions there are so few double ups, I think I only had one session in common with the all of the AEA13 Conference Blogs and that with Chi Yan Lam Michael Quinn Patton State of the nation on Developmental Evaluation. Jane Davidson had one blog post on the conference. http://genuineevaluation.com/case-studies-of-evaluators-lives-a-cultural-perspective-yes-culture/ Only one this year, normally with Patricia Rogers she has few more but I think she had a busy program of workshops and presentation – on her own account and with Michael Scriven. Roll on AEA14. See you in Denver. Thank you for sharing (and for following through with sharing what you’ve learned at Patton’s qual session!) :D.
Thanks for reading and commenting! 🙂 I enjoyed your conference blogging as well! Sheila — first, thanks for the motivating blog panel…and I was also at the MQP State of Dev Eval and I was most impressed both by the questions from a few audience skeptics but also by Michael’s responses. Thanks for your comments Tom. I agree- great questions and answers contribute to a compelling presentation. I enjoyed reading your conference recap Sheila! #omgmqp is like my favorite hashtag now! Sheila, this is an OUTSTANDING POST!! It is great for someone like me who couldn´t attend #eval13. I was really surprised that we like/love the same kind of evaluation topics, as I would have chosen the same workshops you did… and I´m waiting the arrival of “The future of evaluation in society”. If I can attend #eval14 I will chase the authors too! Muchas gracias Pablo! It was difficult for me to stop writing as I attended so many other great sessions as well. Of note were two fascinating sessions on the topic of evaluative thinking. I also attended Susan Kistler’s 25 Low-Cost / No-Cost Tech Tools, a perennial conference favorite. I’ll have to write about that after actually trying some of them. 🙂 Hope to meet you in Denver in 2014!